Redd Foxx’s real name is John Elroy Sanford (1922-1991), closer to his stage name he used in the 70s sitcom Sanford & Son, co-starring Demond Wilson. He was teenage friends with Malcolm Little (you may know Malcolm Little as Malcolm X) while growing up in St. Louis, Missouri and after dropping out of high school in the early 1940s. 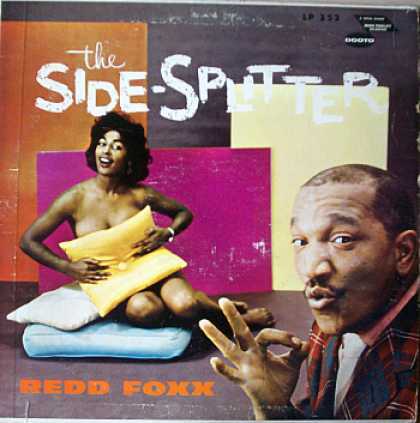 Malcolm X referred to Redd in his autobiography as “Chicago Red, the funniest dishwasher on Earth.” “Red” was in reference to his reddish hair and complexion, and the rest in reference to the fact that he held a number of odd jobs, including a plumber, while auditioning for a career in acting. He found his way into stand-up comedy, and was likely to be the first black comic to play the Las Vegas Sunset Strip, and many of these stand-up acts made their way into albums such as these shown in this post. By the standards of the 1950s to 1970s, his brand of humor was considered racy, but nothing on the scale of comedians in the decades since. The “Foxx” part of his stage name came from baseball player Jimmie Foxx. 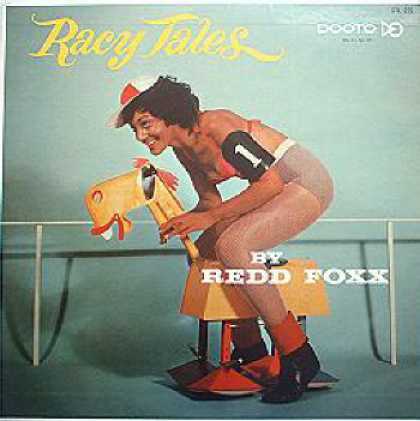 Redd Foxx has released 54 albums of his comedy, according to Wikipedia.